So today we are going to talk about the biggest social media marketing mistake companies are making, bar none. If you are one of those that wants to know the answer and move on, it is not including pictures in your blog and social posts. For those of you who want more, I think this post is going to be a big eye opener today. I am going to show how people are using photos well and how some are crashing and burning. 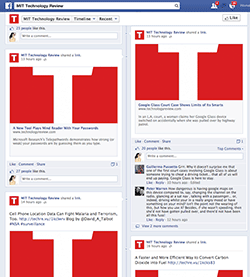 Most of you know about MIT (the technology school) and they have GREAT info, but according to this article, Sharing fast and slow: The psychological connection between how we think and how we spread news on social media by www.niemanlab.org, this is how their Facebook page ALWAYS looks. Full of the MIT Magazing logo. Sigh. No matter how brilliant your “stuff” is, if you don’t have a picture in it for sharing purposes, you are going to be fighting the inertia of most people’s overwhelm. You need to have something snazzy to grab their attention. I was talking to a gal the other day who did not want to have to use the native platform (logging into Facebook, Twitter, etc.) and preferred to use a service like Bufferapp.com or Hootsuite.com to schedule ALL of her posts. The problem with that is that the photos pull in differently depending on HOW you post them and the size of the image in the post. Here are four different posts, which I tried valiantly to maintain in their actual size comparison. The first one was posted the same way that the second one was (with Bufferapp.com) the only difference being that the photo in the post was SO tiny that it could not be pulled in as a large photo (it would have pixilated). The second post is actually not all that bad, it is big enough to attract notice in the news feed and the photo in the post was large enough that Facebook could pull it in easily! The third one is a good example of how Facebook crops photos. I would have been better off to move the words to the middle instead of having them at the top so that they would be more centered when FB pulled it in. Lastly (and obviously the best), I hand posted this, uploading the photo and then adding the link and words. Using the native format (logging into Facebook to post) makes a huge difference and should be used when possible! Before Pinterest, we all had sorta-kinda okay pictures in our our posts that matched what we were talking about. Smart marketers today though, know that having a call to action when a photo is shared will make a BIG difference in how much traffic you get through Pinterest. As you can see, photo one was from the old days and was marginally close to the topic of the article, Is Honest Affiliate Marketing An Oxymoron. That said, because Pinterest is a visual and sharing site, NO ONE has bothered to read the words below it. They do not know that this is a blog post and really the only sharing opportunity I have is if someone likes spiders – which will NOT help to get traffic to my marketing blog! Both the other photos have a strong call to action and let the reader know what the accompanying site and photo are about. These get shared very well and currently Pinterest is the fourth largest source of traffic on my website. Last but not least photo-wise is Google Plus. The same holds true that uploading a photo directly to Google+ makes it big and beautiful (good for people). That having been said, I have heard around that if you post a picture and put a link in the comments it will not show up in Google search as this is a tactic they recognized that the spammers would use to game the system. With that in mind, it is good to post your important posts a couple of times to Google Plus, once with the link pulling the photo and once with the photo loaded separately so that you can take advantage of both types of benefits. You may follow some of the big names in marketing like I do and one thing that I notice is that they have a screen capture of the video they are including AND the video. The reason for this is that they can then post and pin the photo, pulling directly from the post. If all they have is a video, that will not pull in when posting to Facebook and the like. thanks to MarieForleo.com for doing such a good job at this! If you are a pinner (using Pinterest) please click the “pin it” link. If I had just used the photos in this post, you would have been able to “pin” them BUT would not have had the option to pin the picture that tells what the post is actually about! That would have greatly decreased the number of shares I would get on Pinterest and would have hurt my efforts across all the social media sites. 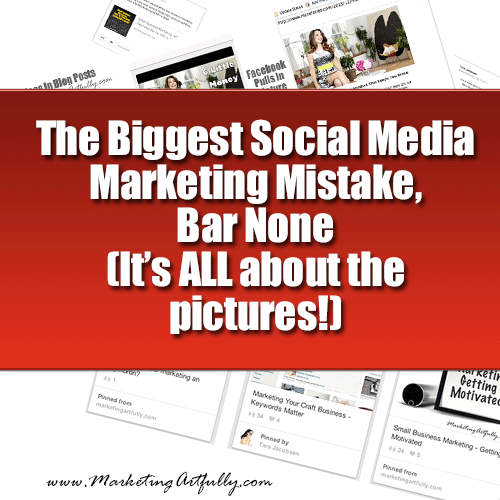 Never have pictures been so important to marketing as they are today and I fully believe that the biggest social media marketing mistake people are making is to not take advantage of the power of photos or pictures in their posts.